Chord Hugo review | What Hi-Fi? We've made no secret of our love for the Chord Hugo. How it has managed to squeeze so much into such a compact box, without sacrificing an ounce of sound quality, is nothing short of astounding - we can't remember a time we enjoyed digital music more. What's on offer with here is an impressive range of connections, including optical, coax and twin USB inputs, with aptX Bluetooth for wireless signals. It can't quite top the choice of the Oppo HA-1 - there's no analogue inputs or balanced options here - but it should still suit most circumstances. Alongside these inputs there's a 6.3mm headphone output and a pair of 3.5mm alternatives, plus a pair of line-level outs for using the Hugo as digital pre-amplifier. Sound good? Add to that portability and a 12-hour battery life, and the flexibility of the Hugo (which can go anywhere 'you go' - geddit?) adds to its charm. All this before you even listen to it, and that's where it really impresses. 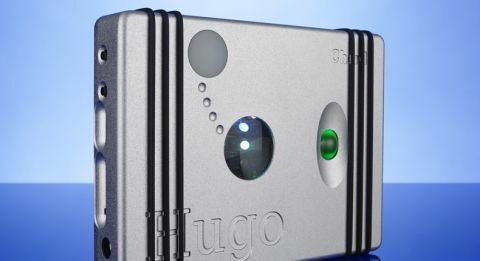 The Hugo accepts input signals up to 32-bit/384kHz, but only through one USB input. The other is saved for use with tablets and phones, and is limited to 16-bit/48kHz. Despite its high-res capabilities, the Hugo is as at home with a 320kbps Spotify stream as it is with a meaty PCM or DSD file (up to DSD128). There’s stacks of detail up for grabs, the Chord delivering much more insight to the finer nuances of a track than the HA-1. This, in turn, gives way to a greater level of dynamic subtlety, timing and organisation that we’ve not heard from any other DAC at this price. This more transparent nature means it’s not as smooth a listen as the HA-1, and not as forgiving at lower-bitrate tracks, but even then you tend not to focus on a recording’s shortcomings, thanks to the Hugo’s inherently musical approach. Of course, it really shines when fed the best of signals, and a DSD file of Stevie Wonder’s Higher Ground powers forward with the heart and energy we found lacking on the HA-1. It’s a masterclass in timing and rhythmic know-how, and is dynamically hard to fault – the bouncing bassline is delivered with absolute precision without sounding uptight. The intimacy and expression with which it delivers vocals is obvious in a playthrough of Ladysmith Black Mambazo’s Lord’s Work. Harmonies are textured, fluid and beautifully presented. Tonally it’s wonderfully natural and a little more even-handed than the Oppo, making it easy to fit into any system. When placed into our reference system, hooked up to our Bryston 4BSST2 power amp and ATC SCM50 speakers, it doesn’t drop a beat, delivering an entertaining and insightful sound, even squeezing out a touch more clarity in the process that we would normally get. Consider its ability to fill in for a £5000 pre-amp without a worry and the Hugo’s £1400 price tag starts to look like quite the bargain. There’s no doubt the Hugo is the best-sounding DAC and headphone amp we’ve heard at this price, and when you add in its portability it becomes a quite superb proposition. The Chord Hugo is nothing less than a stunning achievement – a multi-talented device that will transform your music listening so much you’ll wonder what you ever did without it.